I’m a little obsessed with this painting of the woman at the fountain. 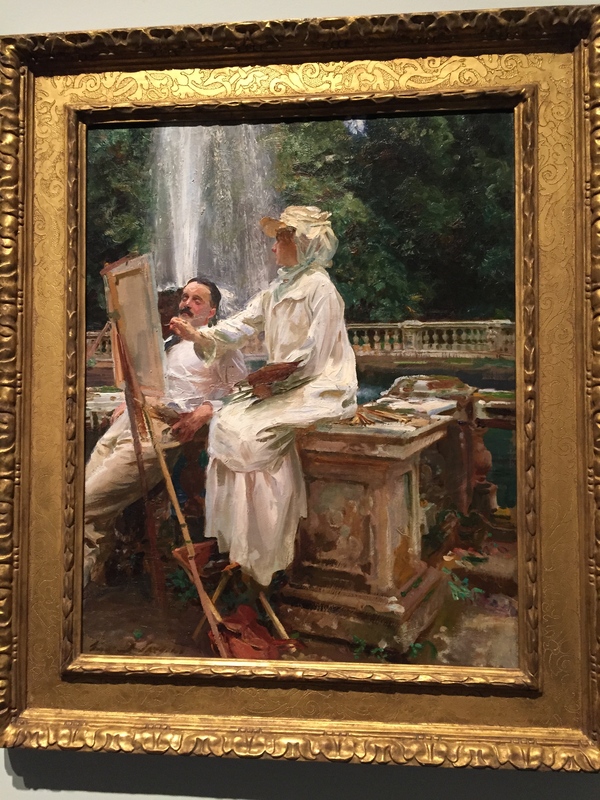 It is John Singer Sargent’s The Fountain, Villa Torlonia, Frascati, Italy (1907) from the Art Institute of Chicago. It has been a favorite painting of mine for decades. 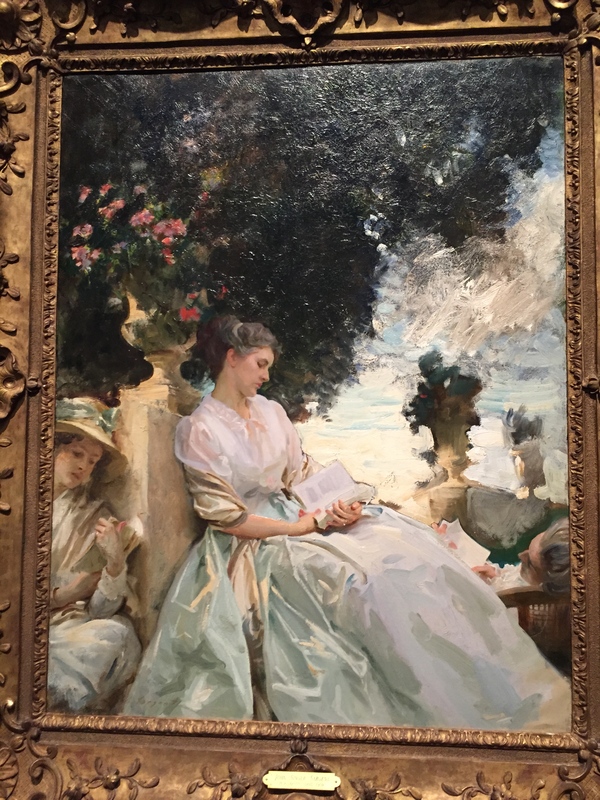 I love the idea that Sargent painted a turn-of-the-century woman artist in such a complimentary way. I decided to do a deep dive into the story behind this painting. It was 1907. The subject of the painting is a female artist in her smock, accompanied by a man who observes her in the act of painting. She is tall, confident, and is looking over the man’s head. She is concentrating on her subject, refusing to be distracted. He is relaxed, scrutinizing the painting in progress. Is he pleased? Is he critical? Is he offering advice? It’s hard to tell. And then there is Sargent, another artist, studying and painting them both. The woman is in the middle. How interesting. Sargent’s subjects in this painting were his friends and fellow artists Jane and Wilfred de Glehn. Wilfred de Glehn (1870-1951) was a British landscape painter who had studied in London and at L’Ecole des Beaux Arts in Paris. He was 37 years old at the time of this painting. Jane Erin Emmet de Glehn (1873-1961) was 34 years old, and had been married just 3 years, no children. (It turned out she never did have children.) She was a member of the prestigious Emmet family of New Rochelle, New York, the youngest of ten siblings. Jane’s great-grandfather Thomas Addis Emmet was the Attorney General of New York and one of the top lawyers admitted to appear in from of the U.S. Supreme Court. Jane came from a long line of successful women artists. Her mother, Julia Colt Pierson Emmet (1829-1908) was an artist and noted illustrator. Jane’s older sisters, Rosina Emmet Sherwood (1854-1948) and Lydia Field Emmet (1866-1952) were both successful painters and illustrators, as well as her cousin Ellen (“Bay”) Emmet Rand (1876-1941) from San Francisco. The Emmets were also distant cousins of Henry James and Edith Wharton. Success, talent and privilege ran freely through the Emmet blood. Jane Emmet began studying art at a young age, following in the footsteps of her older sisters. Rosina and Lydia Emmet had studied at the Académie Julian in Paris for six months in 1884-85, after which they returned to New York to live and work as professional artists. Rosina married in 1887, had five children, and for two decades gave up most of her professional painting projects in favor of informal family portraits. Lydia continued her studies at the Art Students League, studying with such names as William Merritt Chase and Kenyon Cox. Both Rosina and Lydia were actively involved in Chase’s Shinnecock Summer School of Art from 1891-1893, and both of them were commissioned for major works in the Woman’s Building of the Chicago World’s Fair of 1893. Jane’s older sisters helped Jane make incredible contacts in the New York art world. Jane got to meet John Singer Sargent in 1890, when she was just 17 years old. Sargent had arranged for the Spanish gypsy dancer La Carmencita to give a private performance and pose for a portrait at Chase’s 10th Street studio. 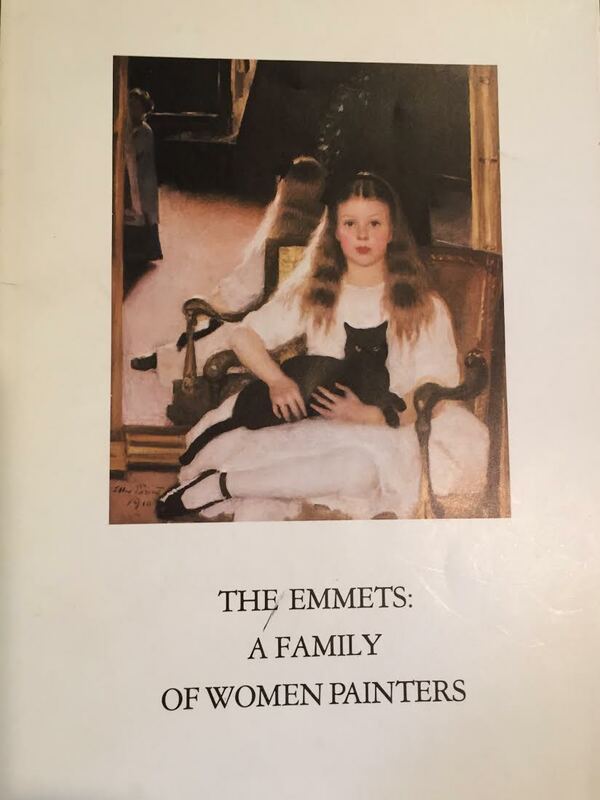 The Emmet sisters were invited, along with a elite group in the New York art world, including William Merritt Chase, Isabella Stewart Gardner, Augustus Saint Gaudens and James Carroll Beckwith. Jane was lucky to be rubbing some pretty legendary elbows at such a young age. In 1897, Jane followed in the path of her older sisters and went off to Paris to study art. Rosina and Lydia Emmet had been underwhelmed with the quality of instruction they’d received at the Académie Julian in the mid-1880s, so it could have been at their urging that Jane and Bay instead sought to study with the famous sculptor Frederick MacMonnies. MacMonnies was a renowned American artist who had been living and sculpting in Paris since he arrived to study at L’´Ecole de Beaux Arts in the mid-1880s. (See my post “Musée Bourdelle and its American Connection” about MacMonnies’ studio at 16 Impasse du Maine in Paris.) By the mid-90s, fresh off the heels of his success with a giant commission for the Chicago World’s Fair of 1893, MacMonnies had began to offer drawing instruction to some of his sculpting protégés such as Janet Scudder. His classes soon became popular with American female painters as well. By 1897, the word was out and the Emmet women wanted in. 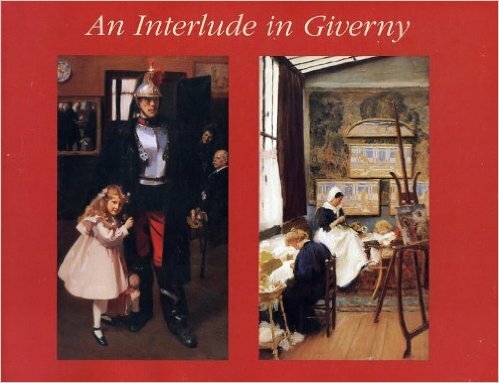 Jane and Bay Emmet arrived in Paris in February, 1897 and found “a fine apartment [in Montparnasse], a cut above the lifestyle of most art students, and access to the inner circle of artists and architects.” (An Interlude in Giverny at 67, see below.) Bay was the first of the Emmet women to be invited to join MacMonnies’ Paris class at Académie Vitti, apparently because she had recently met and impressed John Singer Sargent in London, and had arrived in Paris with his hearty recommendation. Jane Emmet had to settle for painting classes under Raphael Collin at Académie Colarossi at 10 rue de la Grande-Chaumière in Montparnasse, but kept her eye on Bay’s progress with MacMonnies, hoping for the opportunity to join his class. In May, 1897, Bay was invited to join MacMonnies at his summer studio in Giverny. MacMonnies and his wife, fellow artist Mary Fairchild MacMonnies Low (an American from St. Louis) had began spending their summers is Giverny, well-known both then as now as the home of Claude Monet. The MacMonnies welcomed Jane and Bay Emmet, as well as other young American artists to Villa Bêche, their summer rental in Giverny. Bay returned to Paris in the fall of 1897 and went on to have a stunning career as an American portrait artist. Jane returned to New York, her talent failing to attract the same attention Bay’s or her older sisters. In the meantime, Wilfred de Glehn left London in 1891 to study painting in Paris at L’´Ecole de Beaux Arts. While still a student, he was hired to assist John Singer Sargent and Edwin Austin Abbey on their mural commission for the Boston Public Library. Sargent and de Glehn became lifelong friends. Mutual friends said that they both had the same kind of “cosmopolitan attitude.” De Glehn became a part of Sargent’s inner circle. Sargent, Abbey and de Glehn did all of the work for the Boston murals in England but traveled to Boston frequently to meet with the architects or to supervise the installation of new panels. In 1903, they traveled to Boston to celebrate the installation of one of Sargent’s murals, Dogma of the Redemption. It is widely believed that Jane Emmet met Wilfred at the Boston Library installation in January, 1903. Others believe it is possible that Jane and Wilfred met during Jane’s trip to London in 1902. In any event, Jane and Wilfred were engaged by the fall of 1903 and married in 1904. I have just opened a packet of letters and find your, let us say, communication. My God! what a trick to play to your sincere well wisher. I will up and marry in the attempt to be quits. Well, troglodyte of the Cordilleras. I foresee that the time will come when, this first shock being over, I will spontaneously and sincerely congratulate you – especially when I see and like the lady which I feel I am sure to do – and the sooner the better – at this moment the cold sweat is on my brow. I feel as if a very boon companion has been carried off, probably for his good, but also probably to live in America which means to me personally a great loss. However and whereas and nevertheless. These small and discreditable and ill-mannered whisperings must be stifled, and I will train for better sentiments by reading your letter which is very convincing that you are happy and likely to be permanently so. All that your fussy and egotistical of friends will want to hang to, is the chance or the power of contributing a little to your happiness. Be as happy as you like Dear Sir, on those conditions. Don’t be a troglodyte and show this to her and spoil my chance of becoming her friend as well as yours. You may tell her that is my hope and ambition and that I shall be extremely annoyed if she doesn’t like me. Sargent always called him Premp and (this is dangerous territory) I think he was possibly romantically keen on his young protégé. When Willie married Jane Emmet he sulked for some months and only finally gave him a wedding present (A secretaire antique desk with a Lowestoft china dining set which I still have) some six months after the wedding. There are those who say “so what?” and others who say Sargent’s work deserves to be observed and appreciated with a new eye. For my purposes here, I’m just curious (if it is true), what it all might have meant to Jane de Glehn. Did she know? Did she understand? She had been living in an artsy, bohemian millieu for over a decade. She couldn’t have been entirely innocent about homosexuality. Did she turn a blind eye or did she accept that her husband may have had a past? It’s so hard to know. Eventually he came to value Jane who was a capable American matriarch of the type he appreciated. He liked tough women. The three of them grew closer after the de Glehns moved to their new home at 34 Cheyne Walk in London, just around the corner from Sargent’s Tite Street studio. Jane became known for being an excellent hostess to the artsy set of London. As is evident from Wilfred’s painting below, their new home was charming. 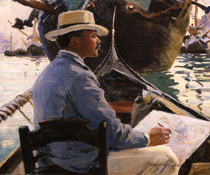 Jane Emmet de Glehn, Wilfred Sketching in a Gondola, 1904. Can you imagine a better souvenir of your honeymoon than this? Jane is very talented, clearly not just a dilettante. In the summer of 1907, the de Glehns ventured out on a grand tour of Europe, starting in the Swiss Alps with Sargent, then traveling south to Florence, Perugia and Assisi before meeting up with Sargent in Rome in September. Jane posed and painted. 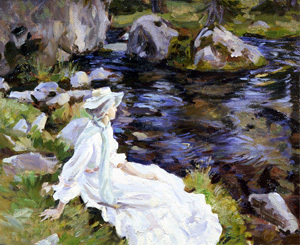 Wilfred de Glehn, Jane by the Stream, Purtud, Val d’Aosta, 1907. In 1907, the de Glehns traveled with Sargent to the Swiss Alps. 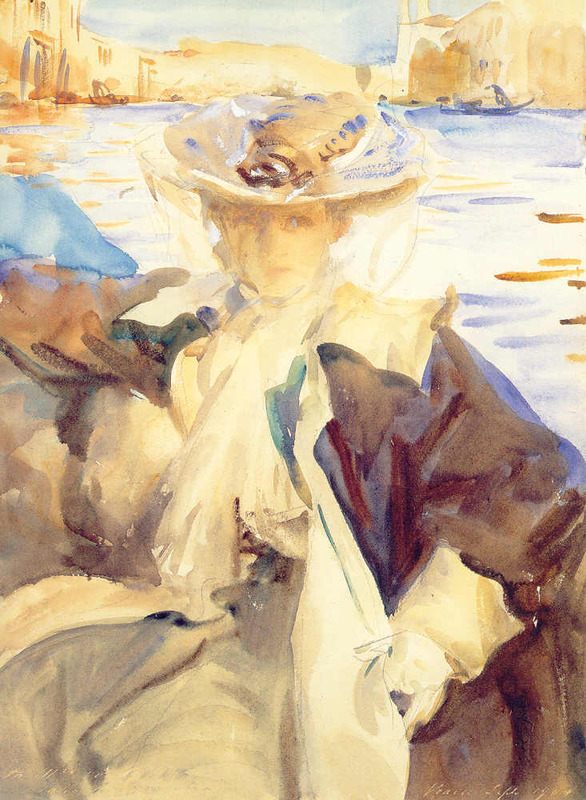 Jane posed for Sargent in the morning and for her husband in the afternoon. Notice Jane’s hat and scarf. It’s the same one she will be wearing when Sargent paints her again that fall for The Fountain, Villa Torlonia, Frascati. 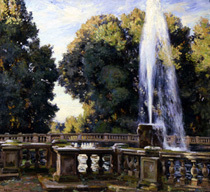 Wilfred de Glehn, Fountain at the Villa Torlonia, Frascati, oil on canvas, 1907, private collection. This is what Wilfred was working on before he took a break to rest beside his wife’s easel. Clearly, de Glehn and Sargent had similar painter sensibilities. The odd pose of Willie lounging beside Jane was an afterthought. “Stay there Premp.You look like her gigalo, I’ll paint you in.” Uncle Willie said it was agony after a while because the stone balustrade cut into his back. He [Sargent] has struck Wilfred in looking at my sketch with rather a contemptuous expression as much as to say ‘Can you do plain sewing any better?’………Wilfred is in shirt sleeves, very idle and good for nothing and our heads come against the great panache of the fountain. So according to Jane, the look on Wilfred’s face (the same face I have been struggling to replicate, argh) is a conscious pose designed by Sargent to tell a story. And what a story. The possible tensions between a husband and wife with equal or similar talent; the joy in artistic friendships, the surprising camaraderie of the three of them. Jane and Wilfred’s heads are both up against the powerful “panache” of the fountain, united but yet separate in their desire and effort to create art out of life. 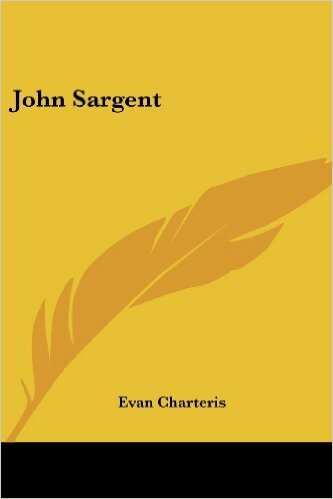 United yet separate in their friendship with Sargent. They continued to paint and travel together until World War I broke out. In September 1909 Wilfrid and Jane joined Sargent, his sister Emily and Eliza Wedgwood in Venice and Corfu. 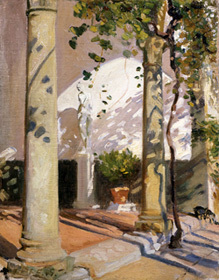 They discovered the dazzling gardens of the Villa Soteriotisa in Corfu, where Sargent would paint In the Garden, Corfu. John Singer Sargent, In a Garden, Corfu, oil on canvas, 1909. This painting was included in the Sargent: Portraits of Artists and Friends Exhibit at the Metropolitan Museum of New York, and features Jane de Glehn in a blue gown surrounded by Sargent’s sister Emily and their friend Eliza Wedgwood. The truth is that Jane painted for pleasure, but her husband painted to make a living. Wilfred became a celebrated British painter, exhibiting widely and receiving numerous awards. He was elected to the Royal Academy in 1932. His exhibit history spans from 1894 to 2002. His paintings appear in dozens of museums today, from London to Australia to Washington, D.C. Jane would occasionally exhibit with him. Jane would never have children and would never achieve the same success as her older sisters Rosina and Lydia or her cousin Bay. She would never be invited to paint the portrait of a sitting president, as Bay was. She would never experience the domestic pleasures of her sister Rosina, who after many years as a successful artist and illustrator, painted numerous portraits of her own five children. And yet. She continued to paint nearly her entire life for the sheer joy of it. 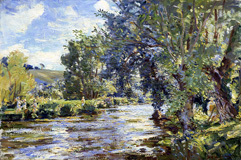 Here is a painting by Wilfred that shows her painting alongside the river Avon in 1943, at the age of 70. If you look closely under the tree on the right, you can see a woman in a white hat and white artist’s smock in front of an easel. After Sargent’s passing in 1925, Jane and Wilfred’s marriage took them through two World Wars. 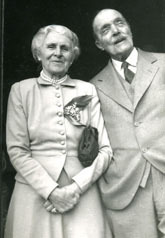 Wilfred would pass away in 1951, Jane in 1961. I would like to think she found great happiness. There is something very powerful and inspiring about her image as the painter at the fountain. An accomplished painter in her own right, a woman who painted for companionship and joy, not for fame and fortune, a true friend to John Singer Sargent, and not just a woman in the middle. 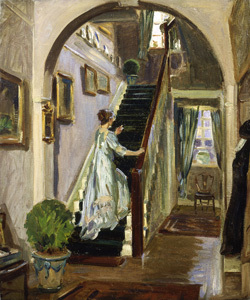 And for a wealth of biographical material on Wilfred de Glehn, see: www.deglehn.com. For John Singer Sargent, see www.johnsingersargent.org. This entry was posted in Art and Artists, Art History, Art History Site, Female Artists and tagged Art Institute of Chicago, Ellen Bay Emmet Rand, Emmet Sisters, Frederick MacMonnies, Jane de Glehn, Jane Emmet, Janet Scudder, John Singer Sargent, Lydia Field Emmet, Mary Fairchild MacMonnies Low, Rosina Emmet Sherwood, Sargent: Portraits of Artists and Friends, The Fountain Villa Torlonia Frascati Italy, Wilfred de Glehn by americangirlsartclubinparis. Bookmark the permalink.